JBS scientists have demonstrated that urine contains DNA from the circulation, as illustrated in the diagram on the right. This circulation-derived urine DNA which is less than 300 bp, designated as low molecular weight (LMW) urine DNA, contains tumor derived DNA if a tumor is present in the body. 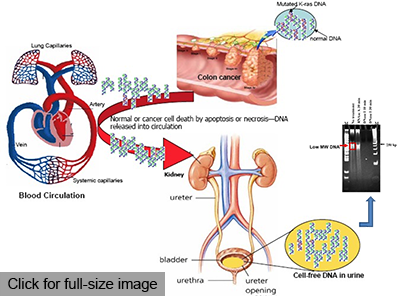 As shown in related publications, listed below, colon cancer markers, such as the K-ras mutations and aberrant hypermethylated vimentin DNA, and liver cancer markers, such as the p53 codon 249T mutation and HBV 171762T/1764A double mutation, have been detected in patients with colon cancer and liver cancer respectively. These exciting results present the promise for the development of new, noninvasive genetic testing for cancer screening, early detection, and disease management. B. P. Song, S. Jain, S. Y. Lin, Q. Chen, W. Song, T. M. Block, D. E. Brenner, and Y-H Su. Detection of hypermethylated vimentin in urine of patients with colorectal cancer. J of Molecular Diagnostic, 14 (2): 112-119. L. Kleinberg, P. J. Catalano, M. K. Gibson, C. A. Staley, E. Montgomery, W. Song, M. F. Mulcahy, L. P. Leichman, A. B. Benson. ECOG 2205: A Phase II Study to Measure Response Rate and Toxicity of Neo-adjuvant Chemoradiotherapy (CRT) (IMRT permitted) with Oxaliplatin (O) and Infusional 5-Fluorouracil (5FU) Plus Cetuximab (C225) in Patients with Operable Adenocarcinoma of the Esophagus: High Risk of Post-op Adult Respiratory Distress Syndrome (ARDS), presented at 52nd ASTRO Annual Meeting; San Diego, CA, International Journal of Radiation Oncology, Vol 78, issue 3, Supplement, Page S72, November, 2010. Y-H Su, M. Wang, D. E. Brenner, A. Ng, H. Melkonyan, S. Umansky, S. Syngal, and T. M. Block. 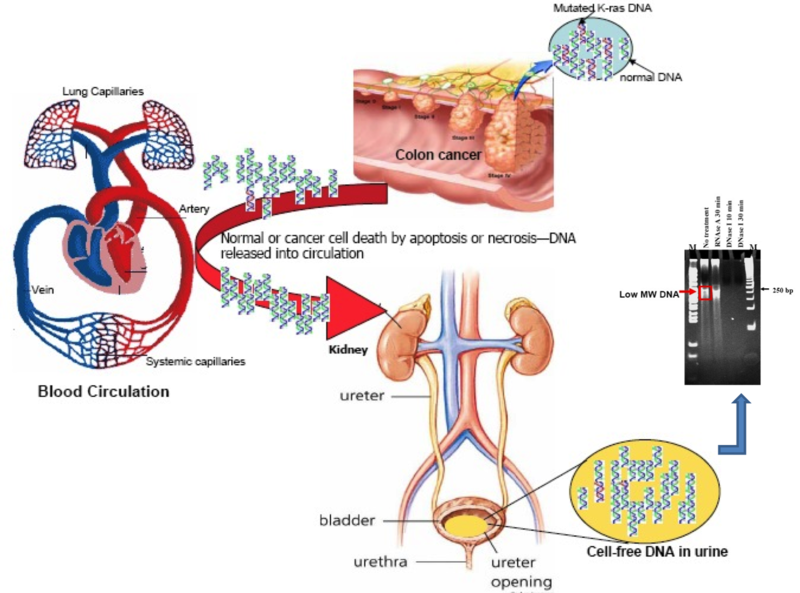 Human urine contains small, 150-250 nucleotide sized, soluble DNA derived from the circulation and may be useful in the detection of colorectal cancer. Journal of Molecular Diagnostics 6, 101-107. (2004). Y-H Su, M. Wang, T. M. Block, O. Landt, I. Botezatu, O. Serdyuk, A. Lichtenstein, H. Melkonyan, L. D. Tomei, S.l Umansky. Transrenal DNA as a diagnostic tool: important technical notes. Ann. N. Y. Acad. Sci. 1002: 81-89 (2004). Cao, L., and Song, W. 1999. Coronary artery disease in men and women. N Engl. J Med. 341:1932-1933(letter). P. Jongeneel, S. Lin, J. Steffen, Y-H Su, W. Song, ChimericSeq: an easy-to-use program for discovery and analysis of integration events from NGS data. Abstract #5290. Presented at the annual AACR conference in April, 2016. S. Jain, H-W Hann, S. Chen, S. Lin, T-T Chang, C-T Hu, W. Song, Y-H Su. Detection of genetic and epigenetic DNA markers in urine for the early detection of primary and recurrent HCC. Abstract #3128. Presented at the annual AACR conference in April, 2016. S. Lin, E. Trauger, B. Song, L. Lan, P. Jongeneel, E. Thompson, M. Hoffman, S. Jain, T-T Chang, T. Block, W. Song, Y-H Su. Detection of HBV-host junction DNA sequences in urine of patients with hepatocellular carcinoma. Abstract #4934. Presented at the annual AACR conference in April, 2016. H.-W. L. Hann, S. Jain, S. Y. Lin, S. Yi, T.-T. Chang, C.-T. Hu, W. Song, Y.-H. Su. Detection of genetic and epigenetic DNA markers in urine for the early detection of primary and recurrent hepatocellular carcinoma. Poster session presented at American Association for the Study of Liver Diseases: The Liver Meeting, 2015. A. Clemens, S. Lin, S. Jain, Y.-H. Su and W. Song. Detection of colorectal cancer-associated genetic and epigenetic alterations in urine of patients with CRC. Poster session presented at American Association For Cancer Research Annual Meeting, 2015. S Y. Lin, B. Song, E. Trauger, M. Hoffman, E. Thompson, R. Zhou, S. Jain, W. Song and Y.-H. Su. Detection of HBV-host junction DNA sequences in urine of patients with HBV-infected HCC. Poster session presented at American Association For Cancer Research Annual Meeting, 2015. S. Jain, S. Chen, S. Y. Lin, A. Clemens, H.-W. L. Hann, T.-T. Chang, C.-T. Hu, S.-H. Chen, W. Song and Y.-H. Su. Development of a noninvasive and sensitive urine screening test for liver cancer targeting circulation-derived cancer DNA biomarkers. Poster session presented at American Association For Cancer Research Annual Meeting, 2015. S. Jain, S. Chen, B. Boldbaatar, S. Y. Lin, R. Yan, C.-T. Hu, H. Guo, T.M. Block, W. Song, Y.-H. Su. Comprehensive analysis of HBV DNA methylation in liver tissues of hepatitis B, cirrhosis and hepatocellular carcinoma patients. Poster session presented at American Association For Cancer Research Annual Meeting, 2014. A. Clemens, S. Chen, S. Y. Lin, S. Jain, T. M. Block, Y.-H. Su, and W. Song. Detection of Colorectal Cancer-Associated Genetic Alterations in Urine of Patients with CRC Poster session presented at American Association For Cancer Research Annual Meeting, 2014. S. Chen, S.Y. Lin, S. Jain, B. Boldbaatar, T. M. Block, Y.-H. Su, and W. Song. Development of a urine test for early detection of liver cancer. Poster session presented at American Association For Cancer Research Annual Meeting, 2014. W. Song, S. Y. Lin, S. Jain, B. Boldbaatar, and Y.-H. Su. Detection of HCC associated DNA markers in urine of patients with HCC for a potential urine test for HCC screening ILCA's 7th Annual Conference, Washington, D.C (selected as one of top 25 posters), 2013. S. Y. Lin, S. Jain, T. M. Block, W. Song and Y.-H. Su. Detection of clonally expanded HBV DNA integration sites as a marker for early detection of HBV related HCC. Poster Session Presented at American Association for Cancer Research Annual Meeting, 2013. S. Y. Lin, S. Jain, B. Boldbaatar, T. M. Block, Y.-H. Su, and W. Song. Development of a target-enriched NGS assay for detecting HBV integration junctions. Poster Session Presented at American Association for Cancer Research Annual Meeting, 2013. Jain, S., L. Xie, B. Boldbaatar, Y.-H. Su and W. Song. Detection of aberrant methylation of the RASSF1A gene as a biomarker for hepatocellular carcinoma. Poster Session Presented at American Association for Cancer Research Annual Meeting, 2013. S. Jain, S. Chen, S. Y. Lin, B. Boldbaatar, L. Xie, T.-T. Chang, C.-T. Hu, J. P. Hamilton, A. A. Evans, W. Song, S. J. Meltzer, T. M. Block and Y.-H. Su. Location matters: The impact of the location of CpG sites on the specificity of methylation biomarkers for HCC. Poster Session Presented at American Association for Cancer Research Annual Meeting, 2012. S. Lin, S., V. Dhillon, S. Jain, T.-T. Chang, C.-T. Hu, Y.-J. Lin, S.-H. Chen, K.-C. Chang, W. Song, L. Yu, T. M. Block and Y.-H. Su. Detection of a p53 codon 249 hotspot mutation in the urine of the patients with hepatocellular carcinoma. Poster Session Presented at American Association for Cancer Research Annual Meeting, 2012.